Made by Lurcat, Jean in Paris, France, 1960-1961. This commemorative ‘Australia’ tapestry is a major late work by Jean Lurcat (1892-1965), leader of the revival of tapestry in France and master of 20th century French tapestry design. It was commissioned for Anzac House, College Street, Sydney (demolished 1988), the State War Memorial to the servicemen and women of NSW who served in World War II from 1939 to 1945. The tapestry was woven by Suzanne Coubely-Gatien at the renowned Aubusson factory in France. Large tapestry, woven in plain weft-face tapestry weave, using fine wool wefts on a heavier cotton warp. The design, on a black ground, features a central sun motif with multicoloured designs of Australian flora and fauna that symbolise the Australian Imperial Forces. The work is designed in three emblematic horizontal bands; in the upper band are birds symbolising the Air Force, in the middle band are animals and flowers symbolising the Army, and in the lower band are fish and marine life symbolising the Navy. 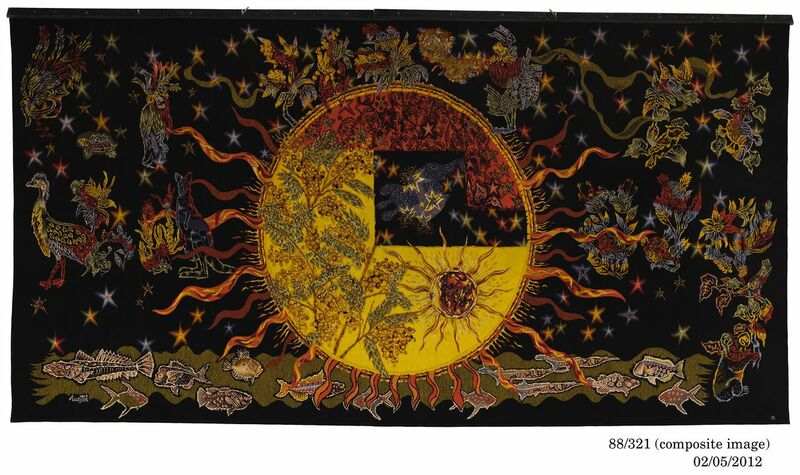 The centre of the tapestry is occupied by the large yellow sun, within which are the Southern Cross constellation, wattle, and the faces of Australian youth symbolising those who died on the battlefields of World War II. In the black background behind the sun are the stars of the southern hemisphere and the Milky Way. The weaver's monogram 'CG' is woven into the lower right corner, and a label with the designer's name, the artist's signature and related information is stitched to the back of the tapestry. Accompanying the object is an inscribed bronze plaque mounted on a wooden backing board with a pedestal stand; the inscription on the plaque provides information about the tapestry. Monogram, within tapestry, front lower right corner "CG" and the image of a crown. Artist details, handsewn square cotton label inscribed with blue ball point pen, verso right corner "Australie / 348 x 700 / jean LURCAT" followed by the artist's signature "Jean Lurcat 2116". Also in faint print behind above inscription "TITRE / DIMENSIONS / CARTON de / EDITEUR SUZANNE COUBELY - GATIEN / AUBUSSON". Also machine made label "...IMITE DEFINI..." and monogram concealed by backing tape. This commemorative 'Australia' tapestry is an outstanding late work by Jean Lurcat, who was born in Bruyere, France in 1892 and died in 1965. Lurcat was a master of modern French tapestry design and led the dynamic revival of tapestry weaving as an art form both inside and outside France. From 1917, contemporary tapestries designed by Lurcat, including a large tapestry that commemorated the resistance movement in France, received world-wide acclaim. For centuries, tapestry weaving had been seen and understood as a medium for reproducing paintings, the more realistically the better. Thanks to the revolution in tapestry design led by Jean Lurcat, tapestries were no longer expected to imitate paintings; on the contrary, tapestry design is now an art form in its own right. The techniques of traditional tapestry weaving are however still followed, although contemporary practitioners are generally free to interpret the design individually and exploit subtleties of colour and yarn texture. The tapestry was woven in plain weft-face tapestry weave using fine wool wefts on a heavy cotton warp, by Suzanne Coubely-Gatien at the renowned Aubusson factory in France. In tapestry weave, discontinuous wefts in selected colours are woven to and fro to form the different elements of the design; these wefts interlock with those of the adjacent, differently coloured design elements and are beaten down firmly to cover the warps completely and so form weft-faced cloth. The 'Australia' tapestry was commissioned by Anzac House Trust, Sydney (representing the Returned Services League of Australia, NSW Branch) as the state's war memorial to the men and women of NSW who served (died?) in World War II (1939-1945). Walter Bunning, one of the architects of the Anzac House building in College Street, Sydney initiated contact with Lurcat in 1956 with regard to designing a tapestry for Anzac House. The Anzac House Trust agreed to the commission and Lurcat's design proposal was received and approved in December 1960. The tapestry was woven in France between 1960 and 1962 and was hung on the eastern wall in the Hall of Remembrance at Anzac House in College Street, Sydney on 10 August 1962. An eternal flame burned in front of it. From the early 1970s however, the Hall of Remembrance was locked after young Vietnam War protesters burned their fathers' World War II uniforms on the eternal flame. Thereafter the tapestry was on limited display only at Anzac House. In 1987, the Anzac House Trust moved to Kent Street in Sydney. A year later the 'Australia' tapestry was presented to the Powerhouse Museum as a Bicentennial gift to the people of New South Wales.